The Tar Sands Healing Walk, is a 14-kilometre spiritual walk through lands impacted by tar sands extraction sites in northern Alberta. The intent of the walk is to raise awareness about the deleterious impacts that the tar sands have had on the land and the people. 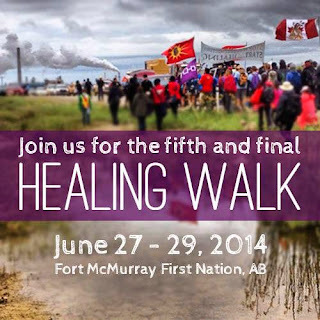 Organizers have announced that this is the final Athabasca region Healing Walk. The first Healing Walk took place in 2010 when people from the Athabasca region gathered together to pray for the land, the people, and the future. In 2013, the walk was joined by over 500 people from across Turtle Island and other parts of the world. 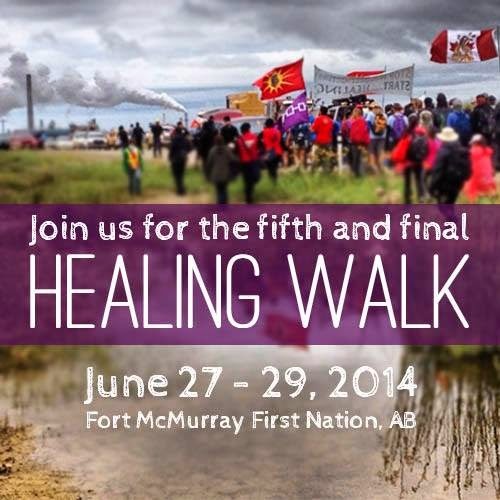 The final healing walk will take place on June 27th to 29th, 2014. The healing walk is a non-aggressive plea for justice and honor, an attempt to defend the land against those who would destroy it for material gain, and an effort to stop the deaths of people who are suffering from the toxic affects of oil exploitation. This healing walk is not just about the Athabasca region, it is also about other communities, other extraction practices, other bodies of water, and other places that have been sacred since time immemorial.